EXTREME weather in Queensland has led to increased encounters with dangerous wildlife - with bull sharks, spiders, and snakes spotted in large numbers. There has also been a report of a crocodile lunging at a 4WD in the drenched state, which is preparing for more rain in parts and for a massive clean-up operation in others. At least a dozen schools will remain closed in north Queensland today and disaster has been declared in the area from Cairns to Townsville. 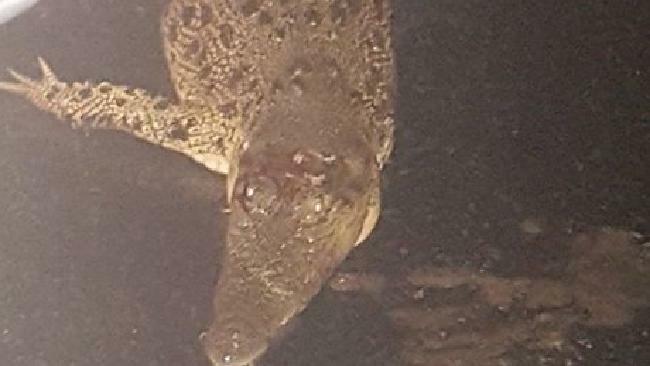 Receding floodwaters have increased crocodile sightings in some parts of the state such as Ingham, according to several residents' photos posted on social media. Four days of torrential rain broke river banks, covered pastureland and cut off nearby towns. Now a new danger looms. Toby Millyard, crocodile researcher at Australia Zoo in Queensland, said the conditions are ideal for roaming crocodiles. He said the reptiles were known to use flood waters in the region to travel to different areas and search for food. "Some crocodiles love it when it rains and they use the water's currents to travel - they're very smart animals," Mr Millyard told Reuters. "But they're very easy to stay away from. As long as you're not in the water or standing by the edge, then you should be fine." Ingham resident Rhonda Brown, came across a crocodile on her way home from work on Thursday evening. She posted a photo to her Facebook page of the injured reptile on Lottery Creek Bridge, warning others of the hidden danger lurking underneath the floodwaters. 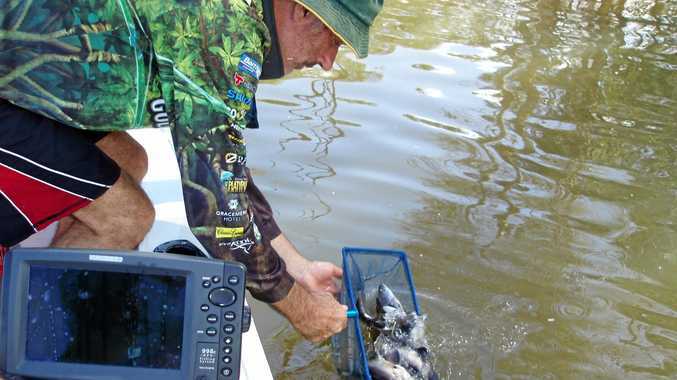 "I wasn't sure if water was over the bridge," Ms Brown told the Townsville Bulletin. "I went past it and realised it was a crocodile - I went back to take a photo." She said the reptile looked like it had been injured. "It looked like it had already been hit by something - it was still alive, I didn't get too close," Ms Brown said. "But on driving (into work) this morning, it had been moved or had got away." 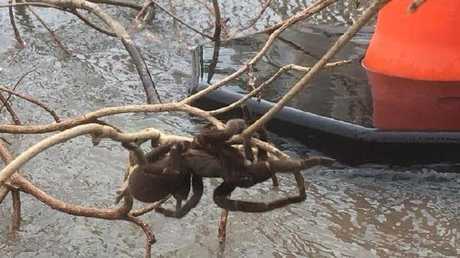 Another wildlife sighting in Halifax, near Ingham, went viral yesterday when a resident spotted a huge spider dangling from a branch overhanging the raging Herbert river. Locals with a soft spot for the creature, plucked the branch from above the river with the spider attached. Queenslanders are not letting the weather stop them from having a good time. Andy Barra who runs Andy's Roadhouse in Ingham said his establishment has been packed with revellers throughout the week. Locals even had a "flood party" on Friday night. "We have been very busy," he told Channel Nine. "We actually look forward to floods, because it's probably our busiest time. "We have plenty of food, we have got accommodation, and it is fantastic. And the people are fantastic. Nothing gets stolen, they are all beautiful people. "We made spaghetti last night and I've got to tell you something, it was fantastic. I made spaghetti for everybody. It is the old Italian way. "My mum taught me how to kick the spaghetti and holy suffering and man did we cook some. And it was coming out of their ears. The steam was coming out. It was fantastic." On Friday night, festivities at the roadhouse reached new heights when residents almost drank the bar dry. "Friday night we went through quite a few bottles of Jim Beam. We ran out of Coke and Jim Beam and everything we had. Even beer. So we couldn't get into town because of the water, buy it was fantastic. And every year we have a flood party. We never miss it." In the past five days, the sheer amount of rainfall has seen the region between Townsville and Cairns declared a disaster zone by the state government. The state's north west is suffering through the worst flooding since 2009. Seven state schools, five Catholic and independent schools, and five early childhood and other care centres will remain closed on Monday, a Department of Education statement said. "Parents are being urged to check local weather conditions and road access, and place their safety and that of their children above all else," the statement said. Among the public school closures were Daintree, Halifax, Ingham and Macknade, as well as Victoria Plantation and Lower Tully and Ingham High School. Parents should check the Department's School Closures website for the latest available information. 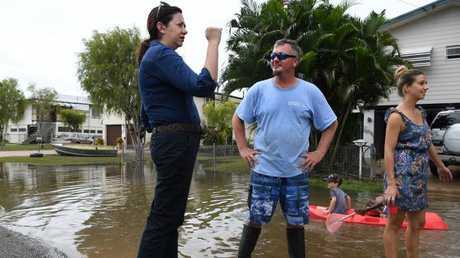 Queensland Premier Annastacia Palaszczuk travelled to the region on Sunday to assess the damage, after the area from Cairns to Townsville was disaster declared. "I don't think people in the southeast realise how much impact this flood has had on this region and the surrounding communities," Ms Palaszczuk told reporters. The Premier said around a third of all the state's local government areas had been disaster declared as a direct result of the flooding, with the town of Ingham, north of Townsville, still cut in half by floodwaters on Sunday afternoon. 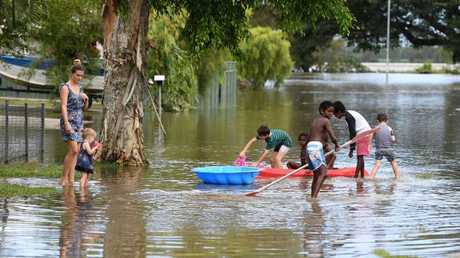 "About 90 per cent of properties have had some impact from the floodwaters," the Premier said. She said the state government would work to make disaster funding available to individuals and local governments. State Disaster Co-ordinator Bob Gee said the work being done by local councils and emergency crews was outstanding. "Can I send this message to everyone out there though - the event's not over," Deputy Commissioner Gee said on Sunday. "Particularly in Ingham, preparation and common sense, people thinking before they act, has worked for us." The weather bureau is forecasting the rain to continue and while a low pressure system in the Gulf of Carpentaria is now considered unlikely to form into a cyclone, it will leave a trail of wet weather across the northern and Gulf regions as it heads west. Forecasters are also closely watching a low pressure system in the Coral Sea, which could form into a cyclone later in the week. The bureau says there's a 20-50 per cent chance of the system forming in coming days, and it's expected to move in a south, south-westerly direction. "We're not really expecting it to come to the coast, at this point, as a tropical cyclone ... but there might still be some impacts, particularly in the sense of dangerous surf for our southern Queensland beaches," forecaster Michelle Berry told ABC radio on Monday. More than 700mm of rain fell in a number of catchment areas in four days, with The Boulders, south of Cairns, receiving 1009mm in the seven days to 9am Saturday. More than 70 students and staff stranded for nearly a week at an adventure camp near Tully were rescued on Sunday after authorities managed to get troop carriers into their location and drive them to Tully airport before flying them to Townsville.